The girl with the red marker whom we first meet in Journey returns in this adventure. In Journey, you will remember, she makes a new friend as she completes the daring rescue of the friend’s purple bird. 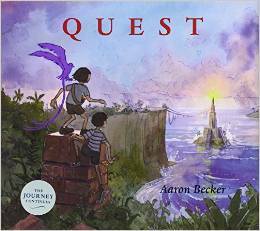 In Quest, the second book in Aaron Becker’s trilogy, she, with her red marker, and he with his purple marker, become fast friends. In this installment, the story begins as the girl and boy are suddenly approached by a mysterious king, orange marker in hand, who thrusts a puzzling map into their hands just before guards whisk him away, but not before the two friends grab his marker. Our heroes set off to rescue the king using the king’s map as their guide. With their inventive drawings, the girl and boy manage to collect all the colors of the rainbow as they crisscross the magic kingdom. After they enter the magic door into the king’s realm, they venture under the sea, ride a rhinoceros through the jungle, escape over a treacherous bridge, and fly to the top of mountains. On the verge of being captured, the miraculous happens, and our heroes rescue the king and return light and color to the world. Without giving anything away, I will tell you there are pages in Quest that will take your breath away. The illustrations are every bit as exquisite as those in Journey. They will invite long, lingering looks and leave lasting impressions. It is the author’s hope that “these stories might inspire us all to place a bit more faith in the power of wonder.” I think he’s on to something.